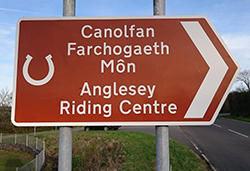 Our postcode is LL61 6LQ, but here in Anglesey postcodes can be quite large! Use this in your satnav and you will arrive at a place called ‘Pen Sarn’ which is about a quarter of a mile short of the centre but on the right road. Keep going and you’ll find us just before you reach the sea. You can get to us by bus, but please be aware that there is a walk of about 2 miles (around 3km) from the nearest bus stop to the Centre. This can take up to 40mins, so please allow enough time. The bus to get is the Number 42 bus from Bangor to Llangefni, click here to see the timetable.